Donald J. Trump is pleased to announce his new Agricultural Advisory Committee. The men and women on the committee will provide pioneering new ideas to strengthen our nations agricultural industry as well as provide support to our rural communities. Mr. Trump understands the critical role our nations agricultural community plays in feeding not only our country, but the world, and how important these Americans are to powering our nations economy. The formation of the board represents Donald J. Trumps endorsement of these individuals diverse skill sets and ideas that can improve the lives of those in agricultural communities. Mr. Trump has received widespread support from voters who understand he is the only candidate with the best interests of the agricultural community at the heart of his policies. Executive board members will convene on a regular basis. The more than 60 advisory board members…Please continue at the above link. The following is the document I submitted to demonstrate the seriousness of the situation of attacks on American Animal Culture although I am not a breeder, I do have concerns that need to be addressed. Dear President-Elect Donald J. Trump- Congratulations on the successful election and a brighter future for all US citizens. I was asked if I was interested in proving my personal experience and concern for the future of agriculture in the United States with an accounting of my experience. I hope for the establishment of the best possible choice for the Secretary of Agriculture. American Animal Culture is under attack and threated from vegan, homegrown Fanatical Animal Rights Terrorists, AR Extremists and AR Organizations such as The People for the Ethical Treatment of Animals (PETA), the Humane Society of the United States (HSUS), Global Federation of Animal Sanctuaries (GFAS), Animal Legal Defense Fund (ALDF), numerous Animal Sanctuaries such as Big Cat Rescue (BCR) and others; all in association with each other with a huge following and an accumulation of millions of tax free dollars collected under the guise of ‘animal rescue’ when in truth, none of these organizations provide a large percentage of the funds collected for helping animals. HSUS provides less than 1% and is under investigation by several state Attorney Generals. HSUS also has lost its charity rating due to an out of court settlement with the Feld Corporation for RICO violations, although I have yet to see criminal charges brought to trial. Money collected for helping animals has been converted for use for paying lobbyists to promote a change in laws to limit animal ownership and usage. State laws are being created for harsher penalties although no crime against anyone had ever been committed with laws that will not help a single animal but instead, create harsher penalties due to the broader use of the cruelty laws which, when used improperly, and in many instances, create a society of law breakers because they were/are animal owners. In most instances of intentional cruelty, there are other laws in place that address the issues such as gambling, public health and public safety- although it is a fact that many of the animal cruelty cases, no law was ever broken with people enduring the strong arm of the law being served in an unlawful manner for a crime that they never committed. I was an exotic animal owner who has been abused by both law enforcement and a judicial system that acted outside their jurisdiction with multiple violations of my God-given right to my expected privacy on my private farm property and my God-given right for ownership/usage of my property (animals) with massive civil liberty abuse against us; the likes of which have gone by completely ignored. There exists a serious threat to all animal ownership and usage and requires the attention of the Secretary of Agriculture with the disappearing American Animal Culture that this country was built upon. The use of emotionally generated claims and the mis-use of what can be considered illegal and un-constitutional state laws has led to a serious attack on all phases of animal (property) ownership with serious violations of AETA law. However, private citizens (animal owners), myself included, for the most part, are not in a financial position to secure legal representation for filing a civil suit for the lack of concern by law enforcement (FBI) for criminal charges and therefore, the actions against animal owners continues and is escalating as no check and balance exists. 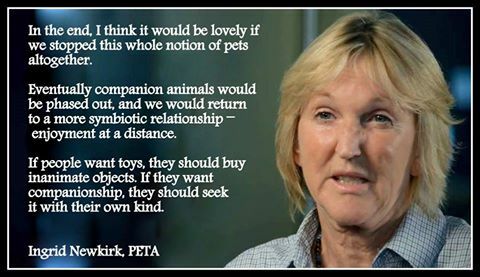 Animal ownership and usage does not automatically make people animal abusers no matter what the usage. Animals are being sold as adoptions with no attention given to state sales tax ever being paid for those so called adoptions and rescues even after clarification from the USDA that stated that no matter what it’s called, is a sale of an animal (property). When an exotic animal is involved, it escalates to a new form of civil liberty abuse as animals are confiscated under the guise of ‘rescue’, under the ‘color of law’ and given away after the conversion of property and is usually done under duress -which violates justice being properly served. I have more than two decades of professional exotic animal ownership without incident, utilizing my animals in both the circus and in educational venues while traveling throughout the United States and Canada. No one so much as ever even insinuated animal cruelty in all that time. My late husband was an 8th generation performer, and we established a rather untraditional form of training which we utilized as our training technique, that demonstrated our relationship with the animals and extreme close contact with each and every animal that we presented. At times, this too was objected to by AR Extremists although no animal was ever subjected to a whip or the use of fire but instead, was an extreme form of gentleness with the largest mixed group of big cats of various species in the US at that time; all assembled together, utilizing spotted leopards, black panthers, royal Bengal and Siberian tigers as well as white Siberian tigers and cougars (15) in the steel cage, all at the same time. Currently, there is no performance on the United States being produced of it’s kind and with the way things are going, it likely will never be again. Education about the animals was our priority goal, often performing at state and local county fairs as our main venue. There are communities that exist through out the United States where people and children have never seen these types of animals; which demonstrates the need for travel to those communities. We focused on our style of training as well as the species of animals that we utilized. Shortly after the loss of my husband and being forced into retirement, I encountered Hurricane Dolly in South Texas which led to seeking hurricane relief elsewhere. I had filed with the Texas Secretary of State as a Not-for-Profit so that I could retain ownership of my animals in order to remain committed for their welfare in a lawful manner. I realized early on that after working in extreme close contact with that group of animals had actually created a group of extremely exceptional animals to the norm, so to speak, and required exceptional care in a manner with which they were accustomed. My animals deserved to remain with me, the only caregiver that most of the animals had ever known, hand raised and bottle fed. After inquiring with the county and seeking to remain legal within the boundaries of Texas law, I purchased property outright in Marion County, Texas where those types of animals would be allowed. Within two weeks of finally relocating to the property in January 2010, more than 1,200 miles from South Texas, I experienced an attack from law enforcement and a ‘self proclaimed’ CEO and president of the local humane society (‘Humaniac’). [Note: Their local Humaniac had no official status or state training as required by law in matters concerning animal ownership and was not the county animal control officer as she had been introduced as and forced upon us by law enforcement who threatened us and my animals (especially the animals) by a state official who was outside his jurisdiction by Texas law. Had we not allow her onto our property (without any warrant)I was led to believe the consequences would be far less than what I wished for my safety nd the safety of my animals. Civil liberty violations included but are not limited to 3 days of unannounced warrant-less searches without due cause onto private farm property without our permission, law enforcement and the local district attorney (extrajudicially), state agents, and one federal USDA agent who was working outside his jurisdiction as I no longer needed or held a USDA permit which was not required by Texas state law. There were no extenuating circumstances to justify any emergency and/or any emergency condition of any animal, yet on the fourth day of their searches, a search and seize warrant was issued that lacked probable cause and was non specific as to what and where they were to seize [Note: “All animals alive, dead and unborn” with absolutely nothing addressing any other property to be taken as evidence, is not a legal description of property or where it was to be found/searched for] Property was to be taken as evidence; some of which was converted in the taking for their own usage. There was no federal participation with the serving of the warrant as the USDA and US Marshal refused to participate -which speaks for itself regarding the USDA inspection with those agencies turning down involvement; No USDA report was ever written. My new partner, who is legally deaf since an early age; “deaf” was noted on the warrant yet, throughout the entire ordeal, his rights were severely violated as no ASL interpreter was brought in, all the way through the first court hearing concerning ownership of our property. What is extremely odd in this case, was that all criminal charges were dropped prior to any hearing, and it suddenly morphed into a civil seizure case, with the court working under a law that states if there are no pending criminal charges, they are to return the (animals) property that were taken as evidence. My partner was booked (no phone call provided as no TTY was made available), charged, arraignment, meetings with court appointed attorneys and the first hearing went without an interpreter. This in and of itself is an extreme violation of both state an federal ADA laws. President-elect Trump, I believe that you are well aware of the difficulties that deaf people face each and every day in the normal function of their day-to-day lives. O believe that this accounting will be considered unacceptable on many levels that law enforcement and the judicial system are still ignoring ADA laws that were established for the deaf for proper communication more then 20 years ago. This case should also be of concern for the appointment of the Attorney General as an area if extreme concern. ‘Access denied’ can not be allowed to continue. The animals were taken as evidence yet, 1/3 were destroyed by the vet hired by the sheriff’s office, joined by and assisted, was the ‘Humaniac’ with out permission from the judge, not us as the owners and without due cause according to the vet records and in other documents. Not a single animal was in duress or a public safety issue before the taking. Nothing was noted on any records that would indicate a reason to euthanize ANY animal, much less the numbers that were killed in the process before the first hearing. The total value of the animals and other property taken was in excess of $300,000.00 yet went before the same Justice of the Peace who issued the warrant and was not trained in matters of law. We appealed the case which went to the County Judge, who also ruled on a case outside the jurisdiction of his court by Texas Constitutional Law, who was also untrained in matters of law; The case was never heard in a Court of Law as required by Texas Law concerning property rights. His judgement further lacks the court’s state seal as required by law. We had filed as indigent, yet it was required that we pay a fee for the appeal, even though Texas law states that persons filed as indigent would not be required to pay a fee for the appeal as it was a trial de novo. State law in such cases does not allow for further appeal even after two judges acted outside the jurisdiction of their courts in a civil matter concerning property rights of ownership. In essence, their judgements were nil. Taking it a step further, we took the issues of civil liberty abuse to the federal district court in Marshall, Texas. The federal court stated the claim of ADA law for an ASL interpreter doesn’t pertain to federal courts. We had a hearing before a federal judge, and once again, in court without an ASL interpreter. My partner was required to provide proof that he, in fact, is totally deaf for consideration for an interpreter should the case go to trial, but this would not include any other hearings or mediation. Mediation took place with yet another federal judge who acted as a mediator from Texarkana, Texas without concern for an interpreter in a matter concerning civil liberty abuse which included the denial of ADA compliance…. Imagine that, how ironic! The case however, was allowed to continue and did continue with ourselves acting as pro se litigants for 2-1/2 years until finally the case met it’s demise when the judge, simply put, with the stroke of his pen, dismissed the case when we missed one of the rules of the court yet was done without consideration that we were pro se litigants although, those very same rules state the court will work with pro se litigants on such issues. Our protest for reconsideration went by and the dismissal remained in place. So, with conflicting affidavits presented to the court by the defendants, our case was dismissed without any concern that this too would be considered a breach of civil liberties concerning the rules set by the court for pro se litigants. I believe the dismissal was a knee jerk reaction to the ‘claim of rescue’ with the defendants bringing issues to the case that simply put, was not a matter of rehearing the original animal abuse case but instead a case brought to the court with concern for civil liberty abuse which included a constitutional question concerning the state animal cruelty law as illegal and unconstitutional. There was no evidence ever presented in any court at anytime that would be sufficient for charges of animal cruelty although those laws were used in Marion County by it’s judicial courts as directed by the Texas District Attorney in Marion County. The federal judge just wiped out the case without addressing a single issue of civil liberty abuse or responding to the question brought before the court that was raised in the filing of the suit. The federal judge was a new appointment from the Obama Administration which allowed for severe civil liberty abuse to occur. The judge was an appointment from a sister county; the Harrison County judge was promoted after the filing of our federal case. We exhausted all attempts for the federal case to be heard with the exception of AETA and RICO that can still be addressed by law enforcement (FBI or the US Marshal service) for both criminal and civil charges to be properly served in defense of US citizens that remains suffering from what occurred and the loss of property however, without a statute of limitations. Citizens residing in Marion County are still subjected to civil liberty abuse with at least two other animal cruelty cases demonstrating the ‘color of law’ abuse and wrongful charges and usage of the Texas animal cruelty law under the guise of ‘animal rescue’. There is little doubt that other unlawful abuse still exists concerning law enforcement and the judicial courts with consideration paid to this case that stands alone with such severity of US citizens abuse that is well documented. The shocking remedy of the judicial courts in Marion County was to turn a wrongly titled criminal case of a class ‘A’ misdemeanor went to the JP Court and somehow changed midway as the JP Courts in Texas are not allowed to hear cases beyond class ‘C’ misdemeanor. The case mysteriously became a civil hearing even though the JP Court is also forbidden to hear cases valued greater than $100,000. The warrant issued was criminal and we had were arrested. It then went on appeal to the County Court, that has no jurisdiction in civil matters; the judge of the County Court is not trained in matters of law. Neither of the lower courts in Marion County are courts of law. So in essence, the rule of law that criminal cases remain criminal and civil cases remain civil as procedures contain a separate set of rules occurred and covered up along the way. What I haven’t yet mentioned is the use of the media and social media by homegrown Fanatical Animal Rights Terrorists/Extremists. The media was invited to our property before and during the search and seize without our permission or permission from the judge who issued the warrant. Helicopters circled the property and several news organizations were forced upon us under the threat for our lives, the animals lives and a threat of bodily harm as well as to our personal freedom as the warrant did not call for our arrest. Arrest was used a threat from the officer serving the warrant who detained us with an armed guard left to watch over us. Marion County law enforcement was dressed in full swat team attire as if two older people that they had dealt with the three previous days and had made every effort to cooperate, would somehow resulted into some sort of Waco-style affair. Law enforcement brandished their weapons to us and the media. The emotionally driven media reports would be used later for fundraising off the backs of the seized animals and continued in the media for emotional driven responses; including death threats and for the collection of donations. Due to our concern for the treatment of some of the animals (poultry) that were about to be killed in place, on our property; led to our protest of such action by the state health inspector, we were then arrested. We were denied our freedom on extremely excessive bail, and with no consideration for our release on personal recognizance until the extortion began, forcing me to agree to giving up ownership of my big cats after a week’s stay in the County Jail. I believe that it is extremely important that the Secretary of Agriculture be aware of these issues and to recognized that while states are allowed to create their own laws concerning the animal cruelty issue; both state and US Constitutions address concern for people, not property, and must remain in compliance with Constitutional Law. Obviously, another area of grave concern is that law enforcement as well as judicial courts operate in accordance to state jurisdiction of the law and their courts with all cases. Animal cruelty laws were established to address matters of intentional animal cruelty and not issues that can be created to make any animal owner guilty when no intentional crime had ever been committed against any person thus less an animal. For example, currently, an animal owner can be charged with abuse if a water bowl just happens to be empty or was tipped over when the “inspector” visits, or if they fail to see the water/food dish. Cruelty laws are to address issues that an animal must be in such severe distress as a threat to its life. If there is any question or if further information be needed please feel free to contact me with this matter that is of extreme importance to me as I remain suffering from such abuse and the loss of property. Lets Make America Great Again! ~ by topcatsroar on November 16, 2016.
:( We must back a man willing to “Make America great again”! Understand the Constitution and the Bill of Rights”, animals are private property. This would be a huge shock as Mr. Trump is supposed to be a staunch “conservative”, while Ingrid Newkirk is a rabid “liberal” (NEO-Liberal, actually). I have no use for the likes of Ms. Newkirk! I am already feared and/or “hated” by some of the local pro-establishmentarians. I have even taught a few of our “police” a few critical lessons about rights and the “law”, and how to properly enforce the Law. The “managers” of the System, use all of these “political pressure groups” expertly-well. Agree with you on that point but would take it a step further. Public laws can not apply to private property…when are these people going to wake up!?! “Public Laws” should only apply to actual crimes (that is, with actual, harmed victims) committed wrongly against others. – So YES, in total agreement there.